This weekend we begin a five-week stretch of meditation on John 6, a kind of summer Eucharist-fest that comes around every three years. The rationale for this is that we are in Year B of the Lectionary, which covers the second Gospel, the Gospel of Mark. Now, Mark is the shortest of the Gospels, so in order to fill it out, the Church inserts John 6 into the middle of the Lectionary readings, near Mark 6, which recounts the same event, the Feeding of the 5,000. John’s account, however, is much longer and includes a long discourse on the theme “Bread of Life” after recounting the miracle itself. John doesn’t have its own lectionary cycle year, but rather most of the Fourth Gospel is read during Advent, Christmas, Lent, Easter or other significant feast days. John 6, however, doesn’t fit naturally into either the Advent-Christmas cycle or the Lent-Easter-Pentecost cycle, so the Church shoehorns it into the middle of Ordinary Time in Year B. So what we are going to get this Sunday and the next four following is a survey of key Eucharistic types from the Old Testament in our First Reading, paired with each successive unit of John 6 in the Gospel. Elisha is in Gilgal when this event takes place. Many cities in ancient Israel were named Gilgal—this one is probably in the hill country of Benjamin or Ephraim, since Elisha ministered in northern Israel. As this scene takes place, Elisha is gathered with approximately 100 persons called “the sons of the prophets” (2 Kings 4:38). The “sons of the prophets” were forerunners of modern religious orders. The term “son” meant “disciple” in this context. The “sons of the prophets” were students and followers of the prophets, who lived in community according to the prophet’s teaching, and preserved his writings and oracles after his death. This particular group was a like a “third order,” as it consisted of families rather than celibate men, but the prophets who led them (like Elijah and Elisha) were, to all appearances, celibates. We tend to forget about the OT tradition of prophetic celibacy, but a whole string of figures in the Israelite prophetic tradition abstained from marriage for the sake of the “kingdom of God,” that is, their higher prophetic calling: Elijah, Elisha, Jeremiah, Ezekiel (after the death of his wife), John the Baptist, John the Apostle, Jesus, St. Paul. The northern Israelite faithful were in a pickle during the period of the divided monarchy, because the only legitimate place of worship was Jerusalem, but travel there was politically impossible due to the political schism between the northern and southern kingdoms. The north did have shrines to the LORD, but they were government-run and were characterized by many different kinds of liturgical violations and illicit activity. So what were the faithful of the LORD in the north to do? In this passage, we see one man bringing to Elisha the firstfruits that normally would go to the Temple. This seems to be how the “sons of the prophets” coped—they brought the sacrifices and offerings to the prophet rather than the illicit northern shrines or to Jerusalem, which was inaccessible. So the sons of the prophets here also constitute a kind of “underground Church”, like the faithful of China who are frequently caught in almost impossible political-liturgical dilemmas. The man from Ba’al-shalishah brings barley loaves made of firstfruits, so we know it was in the spring, at around the time of Passover, because Passover falls at the beginning of the barley harvest (barley is the first grain to ripen), and Pentecost marks the end of the wheat harvest (the last grain to ripen). So there is a connection with our Gospel: both incidents occur around the Passover. 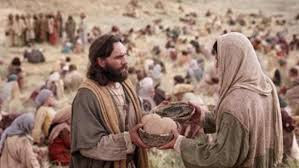 And so Elisha feeds a hundred persons with twenty loaves of bread—no small feat, as normally this would just mean a bite for each person. But we see the scale of Jesus’ miracle is orders of magnitude larger: less loaves (five, 25% of Elisha’s), and the crowd much larger (5,000, or fifty times larger than Elisha’s). So we see how much greater is Jesus’ power than the prophet regarded as the greatest miracle-worker of Israel’s monarchic period. Psalm 145 is a pivotal psalm in the structure of the Psalter. Significantly, it is the last Davidic Psalm of the Book of Psalms, constituting David’s “last word” in this inspired songbook. Furthermore, it is one of only two Psalms that discusses the concept of the “kingdom of God”: the other is Psalm 103:19, but Psalm 145 develops this concept far more than Ps 103. It is as if, in David’s last words, he acknowledges that though he is, by some measures, the greatest of Israel’s kings, still his kingdom pales in comparison to the divine kingdom, which is the only kingdom truly worth participating in. 16 You open your hand, you satisfy the desire of every living thing. David’s kingdom was a shadow of God’s kingdom, which is made manifest on the earth in the Church militant. We still, as Catholics, live in the kingdom of David, governed by Jesus the Son of David, ruled on earth by his vicar, the royal steward we call the Pope. And we are well-fed in this kingdom, because Jesus makes available to us his Body and Blood on a daily basis. One of the major themes of this passage of Ephesians is unity: we strive to preserve the unity of the spirit in the bond of peace, since there is one body, and one Spirit, one Lord, one faith, one baptism. This is why denominationalism and schism is not from God and is an offense and impediment to his plan of salvation. This unity is connected to the Eucharist, which is the one body of which Paul speaks. Since we share in the one body, we become one body. The Eucharist is the sacrament of unity. At the same time, the Eucharist is not magic, such that it forms unity where none really exists. Just as two persons who are not bound covenantally and sacramentally, and have not consciously and publically devoted their lives to one another, do not become married simply by engaging in sexual relations with one another, so the Eucharist will not create unity is we just pass it out to all comers, regardless of their behavior or what they believe. Although there are always some theologians who advocate this view, the experience of the Church contradicts it. Laxity about Eucharistic discipline does not produce unity in the Church, but rather condones and encourages interior schism and dissent, causing them to fester until they become an open break with the Church. That is why, every time we take the Eucharist, we should be in a state of grace and should strive truly to believe everything that the Catholic Church proposes as revealed from God. John 6: 10 Jesus said, “Make the people lie down (Gk anapipto).” Now there was much grass in the place; so the men reclined (anapipto), in number about five thousand. 11 Jesus then took (lambano) the loaves (arton), and when he had given thanks (eucharistein), he distributed (didomi) them to those who were reclined (anakeimenos); so also the fish, as much as they wanted. 12 And when they had eaten their fill, he told his disciples, “Gather up the left over fragments (klasmata, “breakings”), that nothing may be lost.” 13 So they gathered them up and filled twelve baskets with fragments from the five barley loaves, left by those who had eaten. Like most Protestants, I used to deny that this passage had any connection with the Eucharist. However, I had never studied the passage in depth, either. Once one does that, it’s impossible to deny that John makes a Eucharistic connection here, because he purposely uses terms that call to mind the Eucharistic institution narratives of the other Gospels, as well as his own account of the Last Supper. First of all, notice that John records Jesus performing this miracle on the Passover (Jn 6:4), the feast on which the Last Supper would later take place (Mt 26:17). Secondly, note that the occasion for the miracle is Jesus sitting down on a mountain with his disciples (6:3), just as later, he will sit down with his disciples on Mt. Zion to celebrate the Last Supper (cf. Lk 22:30). Fourthly, note that at the heart of the miracle account (v. 11), John describes Jesus multiplying the loaves by using five words that occur in the Last Supper/Institution Narratives of the other Gospels: take (lambano), loaf/bread (arton), give thanks (eucharisteo), give/distribute (didomi), and recline (anakeimenos). Then, he describes the bread that remains after everyone has eating using the rare word klasmata, literally “breakings,” which echoes the Last Supper accounts that speak of Jesus “breaking” the bread. In the discourse that follows (John 6:16-71), more themes from the Last Supper/ Institution of the Eucharist crop up. Jesus discusses the idea of eating his flesh and drinking his blood, and the only other places in the New Testament where eating Jesus’ body and blood are mentioned are in the Last Supper accounts of Matthew, Mark, Luke, and Paul. In particular, nothing in John 6 prepares the reader for the introduction of the idea of “drinking blood” in v. 53, and it adds nothing to the discourse except to reinforce the Eucharistic interpretation of his words. Jesus also discusses his desertion by his own disciples (vv. 60-66) and predicts the betrayal by Judas (vv. 70-71), both of which are major themes in the Gospel accounts of the Last Supper. One can’t reasonably argue that all the connections between John 6 and the accounts of the Last Supper and the institution of the Eucharist are merely coincidental. Any trained Bible scholar will concede that, by the standards of modern biblical exegesis, one must acknowledge a connection. And the connection is not subtle. The first Christian readers and hearers of John’s Gospel would have had to be tone deaf not to recognize the common language and themes between John 6 and the institution narratives! After all, the institution narrative, in one of its variations, was recited every week at the primitive Eucharistic celebrations of the early Church! And this food is called among us eucharistia, of which no one is allowed to partake but the man who believes that the things that we teach are true…. For not as common bread and common drink do we receive these; but … we have been taught that the food which is blessed by the prayer of His word, and from which our blood and flesh by transmutation are nourished, is the flesh (Gk sarx) and blood (Gk haima) of that Jesus who was made flesh. For the apostles, in the memoirs composed by them, which are called Gospels, have thus delivered unto us what was enjoined upon them; that Jesus took bread, and when He had given thanks, said, “This do in remembrance of Me, this is My body;” and that, after the same manner, having taken the cup and given thanks, He said, “This is My blood;” and gave it to them alone. —is it plausible that they would not see the obvious line of connection to the Eucharist they were about to consume? I don’t think so. I submit to you that there is no way the early Christians did not read John 6 in a Eucharistic sense, since they habitually read the Gospel at the Eucharistic celebration! Moreover, I submit to you there is no way the author of the Gospel did NOT realize how his words would be understood by early Christians. In other words, John had to have known the early Christian community would understand John 6 be stressing the necessity of Eucharistic communion, and therefore must have intended the text to communicate that point. Both as a scholar and a believer, I find this argument—the argument from the early Christian community’s understanding of John 6—to be the most compelling reason for accepting the Bread of Life discourse in John 6 as, ultimately, a statement concerning the Eucharist. This Sunday, like every Sunday, provides us an opportunity to give thanks (Eucharistia) for the gift of God’s presence among us in the form of his body and blood, which nourishes us spiritually as we travel through a world of political, social and ecclesiastical confusion, in which both the leaders of church and the leaders of state seem self-interested and misdirected. Just like Elisha’s “sons of the prophets” struggling to be faithful in the intolerable situation of the divided monarchy, and like the disciples and crowds of Jesus day—ruled by an imposter king and impostor high priests in Jerusalem—nonetheless in both situations, and for us today, Jesus the Good Shepherd comes to us and satisfies our hunger with his presence. Justin Martyr. (1885). The First Apology of Justin. In A. Roberts, J. Donaldson & A. C. Coxe (Eds.), . Vol. 1: The Apostolic Fathers with Justin Martyr and Irenaeus (A. Roberts, J. Donaldson & A. C. Coxe, Ed.). The Ante-Nicene Fathers (186). Buffalo, NY: Christian Literature Company. Emphasis mine. Justin alludes to the Gospel of John here. “That Jesus who was made flesh” is an allusion to John 1:14: “The Word was made flesh and dwelt among us.” The phrase “flesh and blood of Jesus” is an allusion to various passages of John 6 (e.g. v. 53, “unless you eat my flesh and drink my blood you have not life in you,”) because John alone of the Gospel writers uses the combination “flesh and blood” (Gk sarx kai haima) whereas the other Gospels use the pair “body and blood” (Gk soma kai haima). One needs to remember that the early Christians were largely poor persons, and the vast majority did not have the money to afford to buy books, even if they could read. Christians did not own their own Bibles—they were dependent on the public reading of Scripture at the gathering of the Christian community, which took place on a weekly basis when everyone gathered for the Eucharistic celebration.